Kurt and Andra Green were recalled from Champaign and sent to Santa Barbara/Goleta to work with Steve and Denise Farrell. Wes Cohen was commended to the Work in Goleta in the spring of 1985. Other Leading Brothers have been Randy Sutton, Mike Struven and Randy Verhoeff. In 1992 Brian Steele, a USB student, had the distinction of being "the first Saint deprogrammed from the Assembly". He spent two weeks at Wellspring Retreat, where he wrote Robert Lifton's Criteria for Thought Reform Applied to the Geftakys Assemblies. In September 1998 the saints in Santa Barbara were aired for a month on a weekly one-hour cable TV program addressing the theme "Life's Great Questions" with street interviews and call-in questions by viewers. Goleta had a tent campaign in July 2000. 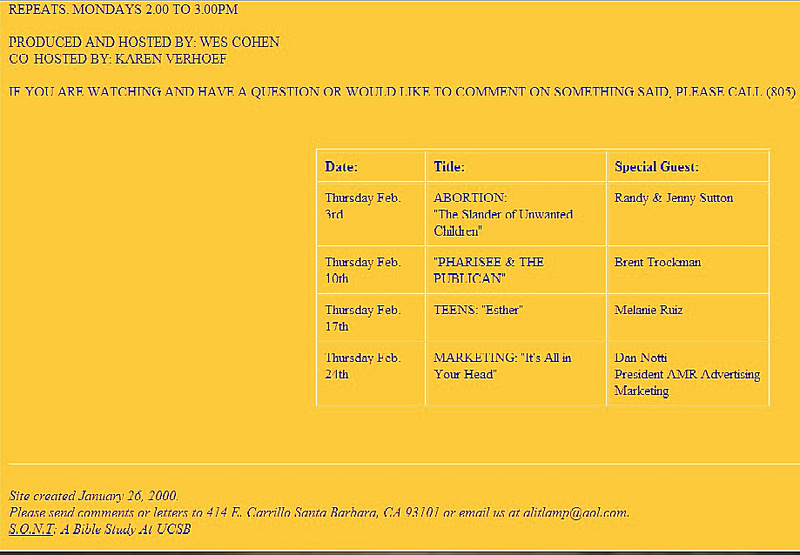 In March 2001 there was a Single Sisters Retreat in Santa Barbara/SLO, with Tim & Ginger G. speaking. In February 2001 Santa Barbara cable TV broadcast a 26-week series on "Passages of Faith: Signs of the Times" featuring saints in the Santa Barbara Assembly. "S.O.N.T" at the bottom of the TV program notes below denotes "Studies in the Old and New Testament". In 2003 the group renounced George Geftakys and refused to have anything to do with him. According to one source, "All the former Leading Brothers have stepped down and are no longer in leadership. As a group we have been painstakingly reevaluating our previous doctrines and views in the past year. A number of individuals regularly visit other Christian gatherings as well. We have moved quite far away [in terms of practice] from where we once were." Wes and Becky Cohen are no longer in attendance. Mike Struven is one of the founders and board members of the non-profit Pilgrims Provisions Ministries, which is registered at his address. A former member's comment: Thanks for the website. I was loosely associated with the group in Goleta a number of years ago. There were some genuine folks involved and they were good friends, but the cult-like structure was a problem, and a few of their fundamental beliefs were less than orthodox. Keswick thinking on steroids has never produced good fruit.